Multi-story horror films, once the mainstay of British company Amicus (Dr. Terror's House of Horrors, Tales From The Crypt, Asylum, etc. ), have been out of fashion of late. It's not hard to see why – the restrictions of the short film format in terms of character and plot development, the difficulty of marketing such a work without sounding like a carnival barker (THREE stories of the grotesque! THREE times the terror!) and the fact that they never set the box office alight or end up on many Best Film lists. Inevitably they also fall victim to the natural selection game, where one story tends to attract more praise than the others, and potential viewers are left with the prospect of sitting through an hour of mediocre material to get to the good stuff. Not a great way to pull in the crowds. Having different directors handle different stories may help the boys in marketing, but it doesn't always proffer the results that the name brands would lead us to expect. Then again, outside of the horror genre, last year's Tickets proved that three very different directors – Ermanno Olmi, Abbas Kiarostami and Ken Loach – could indeed pull together to make an engrossing three-story piece. But if you're going to do it with horror, and in the Far East, just who do you get on board? Well how about Fruit Chan (best known in the UK for his excellent 1997 Made in Hong Kong / Xianggang zhizao), Park Chan-wook (the notorious Vengeance Trilogy, but you knew that) and Miike Takashi (oh come on, if you don't know this name by now...). These are three separate stories with no obvious link other than their dark tone and their indifference to any sort of taste barrier. In Fruit Chan's Dumplings, a fading TV actress visits a woman whose special brand of dumplings are reputed to restore youth and fertility, but just what is the secret ingredient? In Park Chan-wook's Cut, a film director is held captive by a disgruntled extra, who presents him with a nightmarish dilemma involving his wife and a small child. 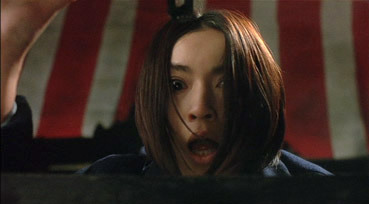 In Miike Takashi's Box, a solitary writer suffering from a recurring nightmare recalls a terrible incident from her youth. I'll say up front that all three stories contain elements that most horror fans will find familiar, to the degree that a couple of the plot twists will not prove quite as surprising as they were perhaps intended. But all three still manage to be both engrossing and disturbing, and when I say disturbing I mean it – there is stuff here that will give even some genre fans a start, and the film as a whole is most definitely not for the squeamish. The stories also wander into dangerous thematic territory, and if you're easily offended then you'll certainly find material here to get you writing protest letters. But it is the nature of modern horror to take you places you will not feel comfortable, and after 100 years of cinema there are only so many taboos left to bust. Not that this will come as surprise to anyone familiar with the films of Park Chan-wook, who in Sympathy for Mr. Vengeance, Oldboy and Lady Vengeance has already dragged us into the darker corners of the human experience. His contribution certainly fits very comfortably into his overall oeuvre, playing almost like the climactic sequence of a fourth Vengeance film, complete with unpleasant revenge plans, dark revelations, and a final twist that seems to have been designed purely to punish the audience. If your only exposure to the talents of Fruit Chan is Made in Hong Kong, however, his cheerfully unflinching approach to very adult subject matter might catch you by surprise (it bloody did me). Though you should work out just what 'the secret ingredient' is very early in the story, this appears to be intentional and just makes what follows even more suggestively (and occasionally explicitly) horrible – that there are flashes of black comedy here and there only seems to heighten the sense of suffocating nightmare of the piece. It may end in the inconclusive manner of many a horror short, but Chan still pulls of a swift, subtle, but gloriously creepy frisson to send you into Park's segment. Probably the biggest surprise of all comes from Miike Takashi, a director who in the past has openly embraced shock tactics, sometimes seemingly just for the fun of doing so. Here he is the very model of suggestive restraint, creating a film that plays more like Nakata Hideo on a quiet day than what we might redard as traditional Miike. There is no final, Audition-like switch to graphic horror here – the story ends as it has plays out, quietly and creepily, a surprisingly low-key conclusion following the body blows delivered by his colleagues. As with all good horror, the three tales also function effectively on a subtextual level. Dumplings works as a critique of modern society's obsession with a particular type of beauty and the extreme lengths some will go to maintain it; Box examines the darker side of sibling rivalry and father-daughter relationships; and Cut suggests something of the filmmaker's own fears and paranoia, a cinematic equivalent of Stephen King's writer-as-victim novels such as Misery and The Dark Half. Technically all three stories are impressively handled, with some lovely editing and cinematography (Dumplings was shot by the legendary Christopher Doyle and Cut by Park's regular lensman Jeong Jeong-hun), even if Park initially seems to have overdosed on David Fincher-style CGI flying camera tricks. All three directors are on form and very comfortable with the short film format, establishing their characters and settings quickly and with clarity before moving swiftly into the narrative proper. Park even takes time to play an opening trick on the unwary, but one that echoes memorably later in the story. Anyone interested in the work of any of these filmmakers will want to check this out, and if you've been following the work of all three – as you should have been – then there is an element of cinematic pig heaven about the enterprise. But be warned. The English title Three... Extremes is well chosen – there's some dark and nasty stuff in here, guaranteed to thrill those who like cinema to push the envelope, but also to offend the sensitive. Which is what extreme horror cinema is all about, isn't it? Framed 1.85:1 and anamorphically enhanced, for the most part the image looks very good, with a fine level of detail, excellent colour and contrast and solid black levels. There is some very slight juddering on fast camera moves, but these are few and far between. A weeny bit of edge enhancement is sometimes visible. The 5.1 sound is very clear and well mixed, especially in Cut, where some nice games are played with the surrounds. Miike's piece uses sound in a sometimes jarring manner, with very quiet voices and silences suddenly interrupted by thunderous sound effects, so be warned. As usual with Tartan, Dolby 2.0 stereo, Dolby 5.1 surround and DTS tracks are available. The 5.1 and DTS are virtually identical, and are definitely the way to go. The Making of Three... Extremes (14:57) is actually an EPK-style featurette about the making of Dumplings – the other two stories don't get a look-in. There are easily read, fixed English subtitles throughout, even when Bai Ling talks in English. This is not one to be watched before you see the film, by the way. The Original Theatrical Trailer (1:39) sells the film very much on its horror elements. There is also the usual Trailer Reel, which features trailers for five other Tartan releases, including the feature length version of Dumplings. A meaty trio of atmospheric and sometimes disturbing horror works from three of Asian Cinema's brightest lights, well presented if short on extra features on Tartan's DVD. The short film format is well used – indeed, it's hard to imagine the expanded feature-length version of Dumplings working as effective as the briskly told tale here. * Horror fans looking for a serious fix need search no further. * It does, actually, but for different reasons than expected. The convention of family name first has been used for all Japanese and Korean names throughout this review.